Our November 2018 Artifact of the Month is a Wright & Ditson No. A "Intercollegiate" shaker sweater manufactured between 1895 and 1905 that sold on EBay in February 2018 for $1,275.00. The mint condition sweater was sold as a circa 1895 Bowdoin College (Maine) football sweater and matches the style and color combination worn by Bowdoin football players between 1898 and 1903. However, after extensive research of Bowdoin athletic team photos we've been unable to find an exact photo match for the gothic "B" font used on our example. Therefore, we cannot definitively conclude that the sweater is from Bowdoin College. At an estimated chest size of 46 and measuring a remarkable 36" in length, it is the largest turn-of-the-century football sweater we've ever handled. 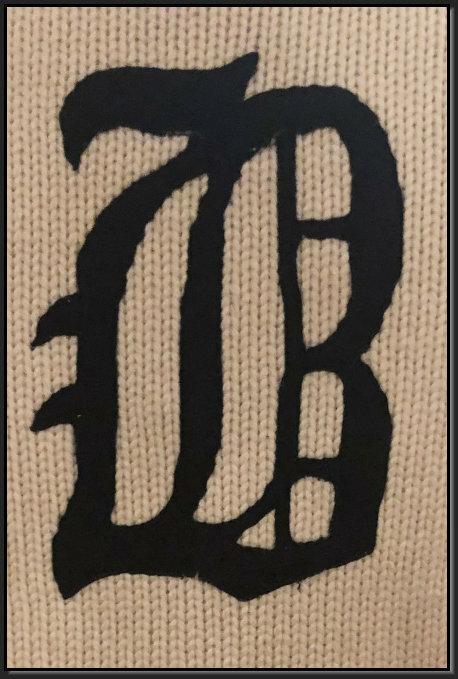 While we couldn't find a font match in the Bowdoin athletic archives, we did identify a nearly identical gothic "B" font used by the Boston Beaneaters baseball team between 1897 and 1899. According to a March 12, 1899 article in the Boston Globe, Wright & Ditson was manufacturing uniforms for both the Beaneaters and Bowdoin College in 1899. Based on this information and catalog and photographic evidence, we conclude that our Artifact of the Month was manufactured between 1895 and 1905. Nineteenth century football players are most frequently captured seen wearing heavyweight lamb's wool athletic sweaters, however, according to Spalding, they were used in "baseball, tennis, boating and by all athletic sportsmen." Monogrammed college sweaters were the letter jackets of their day, distinguishing varsity players from mere mortal students on campus. The sweaters were also utilized as warm ups before and after games and practices. In 1896, Wright & Ditson's No. A Intercollegiate Special Weight sweaters sold for $7.00. A contemporaneous style, the "Turtle Neck Sweater," can also been seen in the 1896 Bowdoin football team photo above. Interestingly, Wright & Ditson's shaker sweater resembles a modern day turtleneck sweater while their turtle neck sweater might be referred to as a sailor collar sweater today.